Purple leaf hop bush can be used to create a dramatic colorful backdrop to your other smaller garden plants. Whether you use this evergreen shrub as a screen or specimen, it’s certain to draw attention to your landscape. The dense branches of bronzy green foliage appear on new growth in the spring; foliage then turns a deep purple-red in summer and fall. This hardy shrub makes a good screen in smaller urban landscapes. It can be hedged for a more formal look, espaliered, or allowed to grow freely in its natural form. It also makes a good statement plants in large containers when kept pruned to size. Plants produce inconspicuous white to pink flowers in the summer, followed by papery seed pods in the fall. 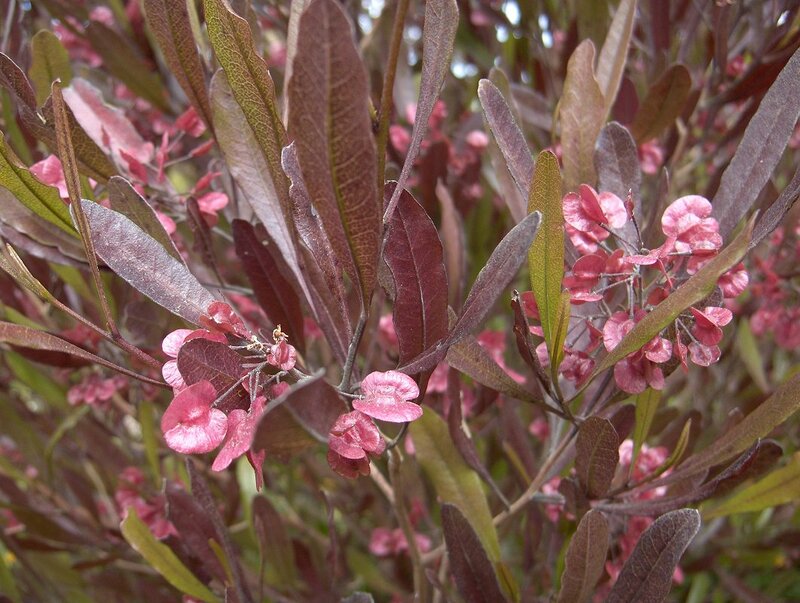 This fast growing shrub is surprisingly drought tolerant once established, but benefits from an occasional deep watering. Be sure to plant in well-draining soils for best results. Carefully consider placement of this specimen in your garden, as it is somewhat flammable and should not be planted near any fire source such as a grill.